their little digs at Britain, which I didn't have any urge to do anyway, I told them about American contributions to Britain's culture - from the tiny boy who learned for the first time, when an ex-schoolmaster US officer dropped in one afternoon to teach school for an hour or two in an East Anglian village, that it was the "Stars & Stripes" and not the "Tarzan Stripes", through the London Kids' "Hiawatha" I told you about, to the last Thanksgiving Day celebration in the Albert Hall, which I wish I had told you-all about. The hall is about as big as Madison Square Garden with a glass roof. Although the V1s and V2s were falling fairly fast, hundreds were turned away. There were some GIs of course, but the majority of the audience were citizens of London. 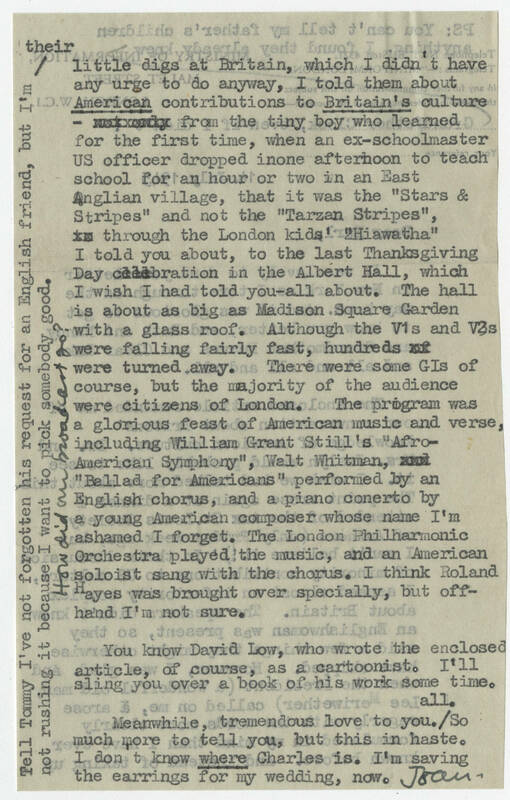 The program was a glorious feast of American music and verse, including William Grant Still's "Afro-American Symphony", Walt Whitman, "Ballad for Americans" performed by an English chorus, and a piano concerto by a young American composer whose name I'm ashamed I forget. The London Philharmonic Orchestra played the music, and an American soloist sang with the chorus. I think Roland Hayes was brought over specially, but off-hand I'm not sure. You know David Low, who wrote the enclosed article, of course, as a cartoonist. I'll sling you over a book of his work some time. Meanwhile, tremendous love to you all. So much more to tell you, but this in haste. I don't know where Charles is. I'm saving the earrings for my wedding, now. Joan Tell Tommy I've not forgotten his request for an English friend, but I'm not rushing it because I want to pick somebody good. How did our broadcast go?